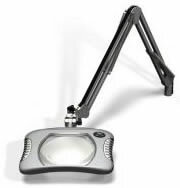 The Vision-Lite® 2000 is the world's first dimmable fluorescent illuminated magnifier. New "patented" state-of-the-art microchip controlled ballast technology allows the Vision-Lite® 2000 to be dimmable from 100% down to 25% so that highly reflective surfaces can easily be seen by dimming the units exclusive "Glare-Free" bulb. An exclusive slide switch allows the operator to change illumination intensity with the stroke of a finger. The bulbs unique design provides three-sided illumination, eliminating annoying shadows that are associated with magnifiers, that have only two-sided, or left and right-sided bulbs. It also eliminates all fluorescent flickering, reducing eye fatigue. The Vision-Lite 2000 boasts one of the largest 46.5 sq. in (7.5" x 6.2") (290 cm2) and clearest 3 diopter (1.75x – 1.85x) lens. It is also equipped with an ESD Safe shade. "Big Eye" is one of our largest magnilites® with a 7.5", 3 diopter (1.75x) or a 7.5" 4 diopter (2x) optical quality lens. Wrapped in a ESD safe shade, it includes a 10" (250cm) shadowless 34-watt cirline bulb. Available with cool white or our exclusive "Glare-Free" bulb, 25" or 43" Ultraflex® arms, excellent holding ability with superior clamp (cast iron). 120 volt Standard reach 25" & 43"
Quality 5" Magnilites®. 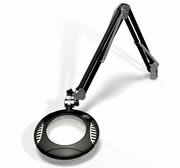 A standard at many work areas for years; Available in either 3 diopter (1.75x) or 5 diopter (2.25x). An optional 3 diopter add-on lens is available to increase magnification. 120 volt / 60 hz Standard reach 25", 37", 43", 45"